Large, hard resin balls with a bias (they are more rounded on one side than the other), so that they curve rather than travelling in a straight line. Each set of bowls is decorated with unique emblems, a small one on the rounded side and a large one on the flatter side. The smaller picture indicates which side the bowl will fall towards, and therefore which direction it will curve. Bowls range in size from 00 to 7. A small rubber mat which the bowler stands on to deliver a shot; one foot must remain on or over the mat while delivering the bowl. The front of the mat must be placed at least 2 metres from the edge of the rear ditch. To protect the green, sometimes a ground sheet is put down just under the mat. The rear edge must be at least 2 metres from the rear ditch. The game of bowls is played on a large, level surface of grass or artificial turf called the Green. The green is surrounded by a shallow Ditch and the ditch is surrounded by a Bank of wood or a similar material. The bank has markings on it which divide the green into separate Rinks, each rink being the space in which one game is played. The bank has the rink number on the center of the rink. The Head is the term used to refer to the area of the rink where the jack and all played bowls are during an end [see Ends below]. There are two teams in every game. Teams can be composed of between one and four people, depending on the type of game being played. The order in which the members of a team bowl is predetermined, and depends on the type of game and number of people on the team. In all games, the LEADS are the first to bowl and SKIPS are the last to bowl on a team. In a triples game, the second bowler is called the VICE. In a four games, the third bowler is called the VICE. Skips are the most experienced players on a team. When not bowling, Skips stand by the HEAD and direct the other bowlers on their team how to bowl. Each game consists of a certain number of ends, usually between 10 and 14, but it can be as many as 21 or more. Each end starts with the rolling and setting of the jack and finishes once all the bowls have been rolled toward the jack. At this point scoring is assessed for that end. The end can also be finished if the jack is pushed out of bounds into another rink or side ditch, but in that case no points are scored. Ends are played from alternating ends of the rink so that the bowls remain on the same ends of the rink from the finish of one end to the start of the next. At the beginning of each end, the Lead of the team which won the previous end stands on the mat and rolls the jack down the rink toward their Skip. 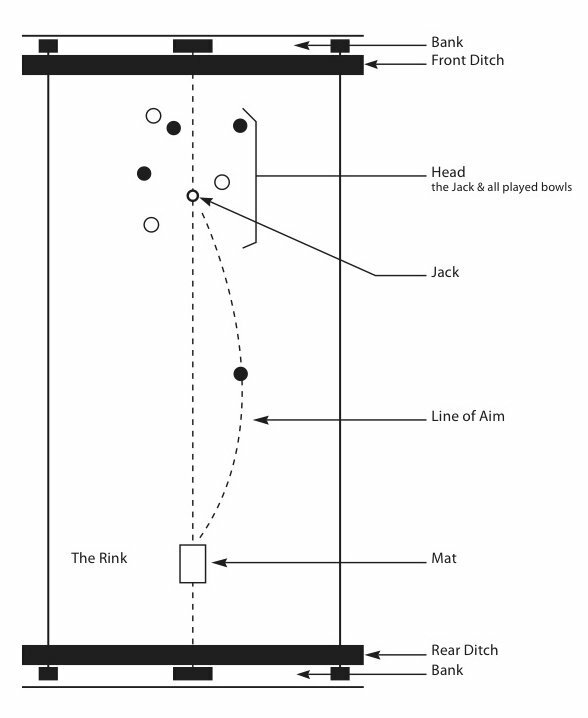 The jack must travel 21 metres or more to be legal, and if this is the case the Skip then centers the jack so that it rests on the centre line of the rink, still at the same distance as it was rolled. This is now the target that the bowlers aim at. Called delivering a bowl, bowling proceeds in alternating turns, although the precise format is determined by which type of game it is. When the skips bowl their final bowls in an end, the end is finished and the team's bowls closest to the jack will be scored. When delivering a bowl, one foot must remain on or above the mat, and the bowl must travel at least 14 metres from the front of the mat to be live. A bowl in its original course which touches the jack, even though it comes to rest in the ditch within the boundaries of the rink of play, is a live bowl and is called a toucher. If a bowl in its original does not touch the jack, it is called a non-toucher. The team with the bowl closest to the jack is the only team which can receive points for that end, and they receive as many points as they have bowls closer to the jack than any of the opposing team's bowls. The Skip or Vice then records the score, and the Lead of the losing team rakes the bowls to prepare them for the next end. If the relative distances of two bowls to the jack cannot be determined by sight, the distances must be measured. Dorothy Macey's "Grasslines: A Player's Handbook, B.C. Lawn Bowling Association 1990 and Laws of the Sport of Bowls, Crystal Mark 3rd Edition 2015.